Chelsea Martin, a 15-year-old Marengo area resident and student at Kindersley Composite School, will display her musical and vocal talents during the live Kinsmen Telemiracle broadcast scheduled for March 2-3 at TCU Place in Saskatoon. 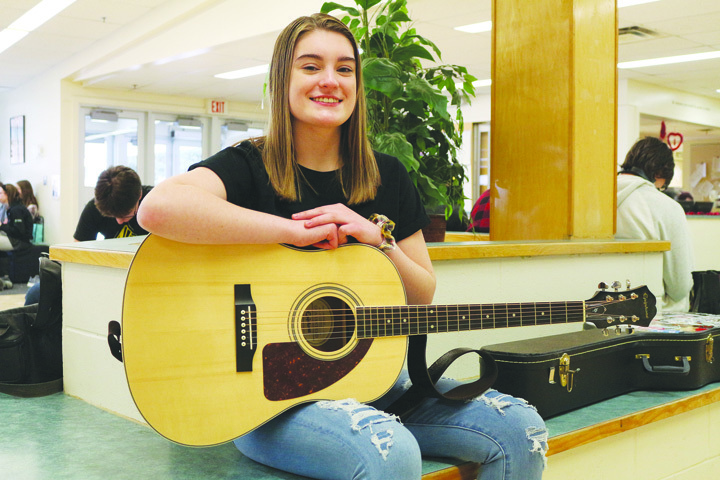 A Marengo area youth attending Kindersley Composite School (KCS) is about to take her musical talents to perform live during the annual Kinsmen Telemiracle. Chelsea Martin, 15, is scheduled to perform during the 24-hour Kinsmen Telemiracle on March 3 at 10:57 a.m. The young performer is playing and singing a cover of Folsom Prison Blues written by country and western icon Johnny Cash during the broadcast. Martin is also performing next week on Feb. 12 at the annual Talent Night Telemiracle with other KCS and Elizabeth Middle School students. All proceeds from the local talent night are donated to the Kinsmen Telemiracle. The fundraiser takes place at the Norman Ritchie Community Centre at 7:30 p.m.